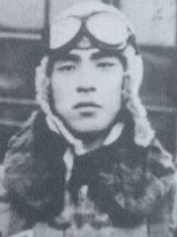 On April 3, 1945, Sergeant Yasuzō Shimizu took off from Chiran Air Base and died in a special (suicide) attack west of Okinawa at the age of 23. He was a member of the 23rd Shinbu Squadron. He piloted a Type 99 Assault Plane (Allied code name of Sonia). After his death in a special attack, he received a promotion to Second Lieutenant. He was from Shiga Prefecture and was a non-commissioned officer who entered the Army in 1941. It has been decided that I will go as a member of the Special Attack Corps in order to become a Pacific Ocean breakwater. Please forgive me for not doing anything at all like an older brother until now. With great kindness and cheerfulness please follow closely the teachings of mother and your older sister, and do your best even in my place to be dutiful to our parents. I will always be watching over you from the skies. The best way to do your duty as a daughter is to have a healthy body. Be very careful to not become sick. I will be at Kudan  in the spring when the cherry trees blossom. Do not neglect your studies. The letter and biographical information on this page come from Chiran Tokkō Irei Kenshō Kai (2005, 99, 189) and Osuo (2005, 195-6). 1. Kudan is a hill in Tōkyō where Yasukuni Jinja (Shrine) is located, and the beauty of Kudan's springtime cherry blossoms is well-known. Yasukuni Jinja is Japan's national shrine to honor spirits of soldiers killed in battle.